Lately, I’ve gotten to wondering who was the first female TV cartoon character to be billed as the solo star of her own series. Not as part of an ensemble cast—as great as Natasha Fatale (“Bullwinkle”) and Velma Dinkley (“Scooby-Doo”) are as characters. Also not as a mere co-star sharing top billing with their husband/brother/boyfriend/some other male partner (Wilma Flintstone on “The Flintstones,” etc.). No, I was wondering what female character was first billed as the top star of their own TV series, just like the guys. For research, I relied on my own memories of cartoon watching and what I found via Google and Wikipedia. For the purposes of this article, I added the qualifier of being an American cartoon, since I’m not an expert on non-US animation (though if any anime or European animation fans wish to chime in, feel free). I also wanted a character created for TV, not theatrical animation or comics. However, it’s worth noting the theatrical shorts of Little Lulu (and her Famous Studios knockoff, Little Audrey) and Betty Boop aired on TV for years. Winsome Witch (nicknamed “Winnie”) was a kind-hearted witch who used her witchcraft powers to combat various threats. Said threats ranged from annoying hunters in her forest to the Pentagon (!) summoning her to combat a master spy they’re unable to combat by conventional means. Despite being occasionally bumbling, Winnie always meant well. Jean Vander Pyl (Wilma Flintstone’s voice) voiced Winnie. Winnie first appeared as one of the supporting segments to Secret Squirrel’s series in 1965; the other segment was Squiddly Diddly, a goofy octopus. Years later, Winnie appeared again in the early 90s’ series “Fender Bender 500,” a “Wacky Races”-style series of races involving classic Hanna-Barbera characters. In “500,” Winnie’s car was dubbed the “Sonic Broom,” a cauldron-shaped vehicle. Her racing partner’s a pet black cat named (ironically) Lucky. The other signature aspect of the series was probably the sound effect whenever Winnie used her powers. It’s the drum roll-and-trumpet-like noise used to introduce Jet Screamer in that classic “Jetsons” episode. “Winsome Witch” is a backup segment to a male character and not a full half-hour series. Still, as far as I can tell, this is the earliest American made-for-TV cartoon that bills a female character as the top solo star. And yes, Winnie’s the one who solves the various problems and/or defeats the various villains in each episode. She sometimes does so by reforming them into good guys (reminiscent of some Golden Age Wonder Woman stories). 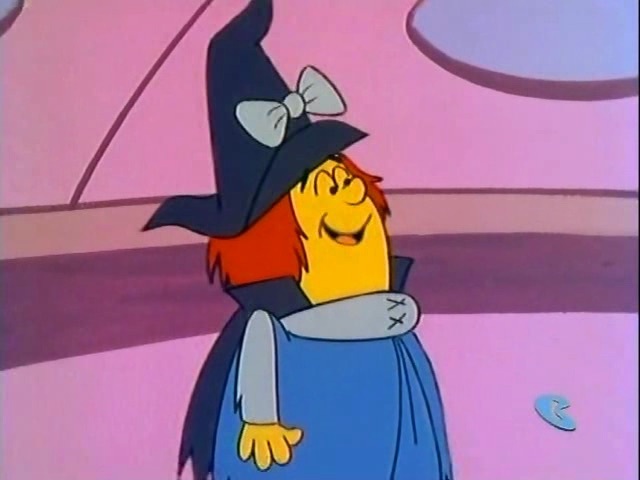 As for why a cartoon about a witch, I’d guess it was Hanna-Barbera’s way of cashing in on the success of “Bewitched,” which debuted a year earlier. Additionally, the primetime sitcom’s opening credits were animated by Hanna-Barbera. The first half-hour cartoon to headline a female character, however, took until 1969 to come along. That’s when “The Perils of Penelope Pitstop” debuted. The “Wacky Races” spin-off lasted one season of 17 episodes, with another season of repeats following. The show, set in what looks like the 1910s or 1920s, features Penelope as the heiress to a vast fortune. However, she’s placed into constant death traps by her guardian, who’s secretly the series’ villain the Hooded Claw. Coming to Penelope’s rescue were the Ant Hill Mob, her former “Wacky Races” competitors-turned-bodyguards. Given the Mob’s bumbling ways, however, Penelope would often end up rescuing herself (and the Mob) half of the time. 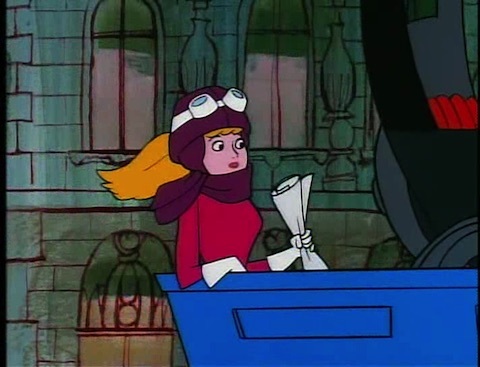 Penelope was voiced by Janet Waldo, also known as the voice of Judy Jetson. Meanwhile, the Hooded Claw was voiced by actor Paul Lynde. I was expecting the first half-hour show to be “Sabrina the Teenage Witch.” However, Miss Pitstop beat Miss Spellman’s solo Filmation series (spun off from 1968’s big hit, “The Archie Show”) by a year. Sabrina would run alongside “The Groovie Goolies” as co-billing for her first season in 1970-71. The second season saw both shows split from each other, and airing on their own. Package shows: "The Plastic Man Comedy/Adventure Show"